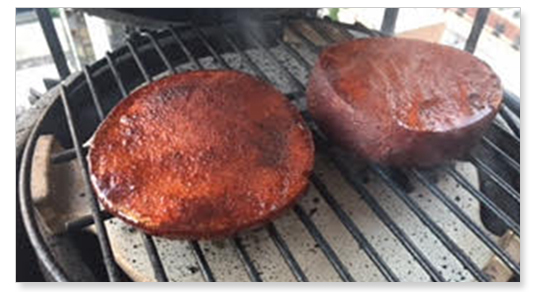 Lee Ann Whippen shares her and her father’s recipe for smoked bologna. Recipe from Lee Ann Whippen, chef/partner at Chicago q Restaurant and daughter of barbecue champion Jim “Trim” Tabb. For more about Lee Ann and Chicago q, visit chicagoqrestaurant.com. “My dad and I are so close … for so many reasons. One of which is our love of BBQ, competitions and cooking. We also share a love of flying planes … he’s a retired captain for TWA and I flew Cessnas and Piper Cubs in high school. Combine the salt and brown sugar in a food processor or blender, and process until well blended. Add all the remaining ingredients except the granulated sugar, and process until blended. Then add the granulated sugar and process until the ingredients are evenly distributed. Set the EGG for indirect cooking with the convEGGtor at 225°F/107°C. Drain apple chips and put directly on coals. Slather yellow mustard all over top, bottom and sides of bologna. Sprinkle dry rub on all sides until completely covered. Place bologna slice directly on the cooking grid and smoke with lid closed for 11⁄2 hours. Remove and cut into cubes and dip in your favorite barbecue sauce … or it’s great on cheap white bread as a sandwich! In the end, I had way too much food, and while there were plenty of leftover ribs and chicken to go around, it was only this smoked bologna that almost disappeared. When the wood is ignited and producing smoke, place bologna in the smoker or grill, and smoke until outside has darkened, 2 to 3 hours.